It’s been a couple years since we checked in with New England Science & Sailing Foundation (NESS) in Stonington, CT, recently named the Outstanding Community Sailing Center in the country for 2013 by US Sailing. We caught up with Cindy Nickerson, NESS’s Executive Director, for an update. Students from Bennie Dover Jackson Middle School in New London, CT sail on NESS’s J/105 Pflash with Sailing Program Director Mark Zagol and Program Director Mary Horrigan. WindCheck: It’s been two years since you changed your name to New England Science & Sailing. How has NESS changed as an organization? Cindy Nickerson: The biggest change has been our evolution from a summer-only program into a year-round provider of high quality adventure education. We’re serving more students – nearly 2,700 last year – and new markets, primarily school groups during the academic year. What hasn’t changed is our mission to offer opportunities for everyone to get on the water, to experience sometimes life-changing personal discoveries, to make connections that foster stewardship of the environment and community, and to offer scholarships to make these opportunities available to all. WC: Do you still offer summer programs? CN: Yes! Summer is our core season, and we continue to push the bar higher on program quality and variety. We have some new keelboats this year, with the generous donation of our J/105 and the purchase of a couple of Sonars. 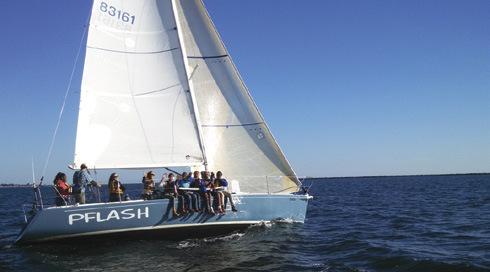 We’re expanding our kids’ keelboat classes and offering unique “combo” classes using keelboats as home base for studying science as well as sailing. We’re also offering new classes like Kayak Fishing and Powerboating “Driver’s Ed,” as we just became a Powerboat Training Center. To better serve working parents, we obtained our Connecticut state youth day camp license last year so we could offer all-day programming along with early drop off and late pick up options. And we still offer the ever-popular marine science classes for children as young as four, sailing classes starting at six, and adventure sports like surfing for ages nine and up. WC: Do you offer programs for adults and families? CN: We do, and we’re expanding our adult and family offerings this year. Weather permitting, we plan to be open on weekends starting this May for sailing, science, surfing, and standup paddleboard classes. And this summer we’ll also continue kayak instruction. This past winter, we conducted family ice fishing classes for the first time and they were a huge hit. WC: What types of partnerships does NESS use to advance your mission? CN: Strong partnerships for program development, program implementation, marketing, and fundraising are more important now than ever. As part of our partnership with the Mystic Aquarium, for example, we conduct joint programs during the summer for teens interested in marine science careers. With our US Sailing partnership, we have contributed to development of their successful REACH program, which uses sailing as the platform to teach science, technology, engineering, and math concepts. And partnerships with many local businesses aid our continuing marketing and fundraising efforts. WC: Congratulations on being named Outstanding Community Sailing Center in the country for 2013! CN: Thanks! We’re so honored to have been recognized by US Sailing. Our entire community deserves credit for this award – our President, Spike Lobdell, our board for their vision and determination, and our staff, who are on the front lines day in and day out, teaching classes and guiding students on their own personal journeys of self-discovery. This award is a testament to their passion, hard work, and dedication. It also highlights the broad appeal of NESS’s public access opportunities as well as the success of our outreach efforts. WC: What does the future hold for NESS? CN: We’ll continue to expand our academic year programming by working closely with more and more teachers and administrators at regional schools. Outreach remains key to our future as we seek to bring opportunities to even more underserved students. We want to expand and strengthen our partnerships, and we must continue our efforts to formally measure the effectiveness of our programs. To continue implementing our facility and dock master plan, we’ll begin additional renovations to improve our teaching spaces and handicapped access; we hope to offer accessible sailing in the not too distant future. WC: How can our readers find out more about NESS? CN: Please check out our website at nessf.org, or call us at 860-535- 9362. We welcome all to visit us in Stonington and take advantage of NESS’s opportunities for connecting with the ocean, having fun, and discovering new skills and confidence. Thank you!